I’m plugging along with the list; I’m not at all confident that I’ll finish by the end of June. I’m taking vacation time that last week, so I’m actually going to give myself through July 5, but even so, it’s not a sure thing. But I can at least check another book off the list, Still Life With Menu, a beautifully composed cookbook by Moosewood alumna Mollie Katzen. The book is made up of menus, including a few for holidays and special occasions. Each menu is accompanied with pastel drawings by Katzen, making for a very beautiful presentation. 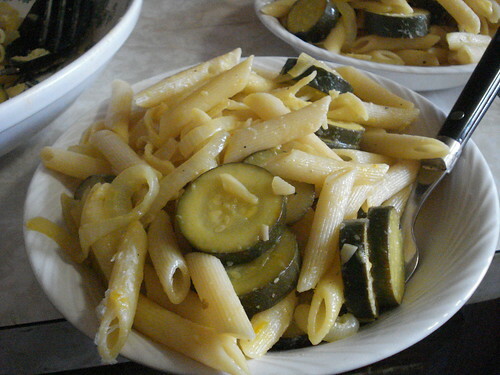 The recipes are also individually indexed so it’s easy to find what you want. 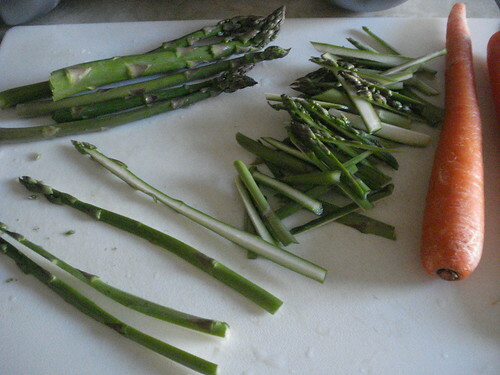 I wanted to make soup for Sunday evening, the end of a rather chilly spring weekend here. I was hoping to do a full menu, but none of the menus as a whole quite appealed to me. I didn’t feel like making a cream soup, in part because we were expecting a lactose-intolerant guest and in part because I prefer lighter, more vegetable-centered soup. I didn’t want to bake bread, I thought; in fact, I realized I didn’t really want to try more than one new recipe for the day. 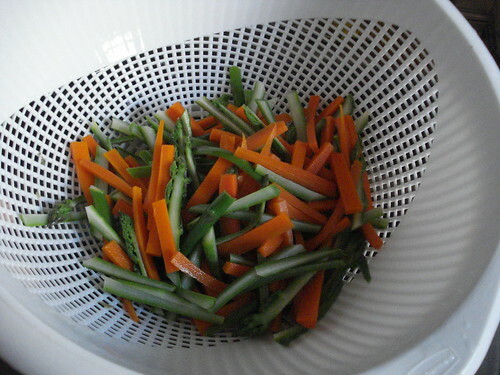 So I decided to make my standard improvised vegetable soup, and went looking for a good accompanying salad. 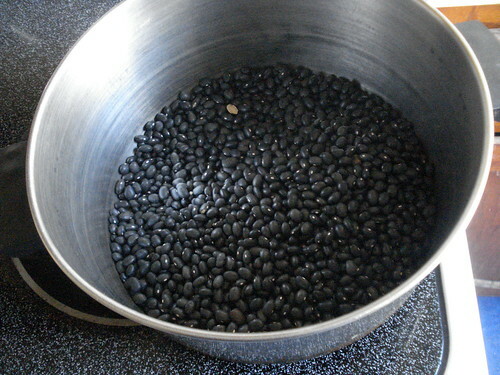 I started the night before, pouring two cups of dry black beans into a pot and picking them over to make sure there were no stones or other foreign matter. Most packaged dry beans today are pretty clean, but it doesn’t hurt to check, and if you’re buying in bulk you’ll certainly want to examine them carefully. 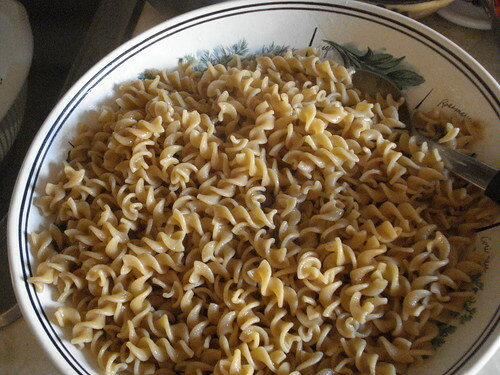 Once I was satisfied, I added water to the pot, covered it, and let it sit until the next afternoon. 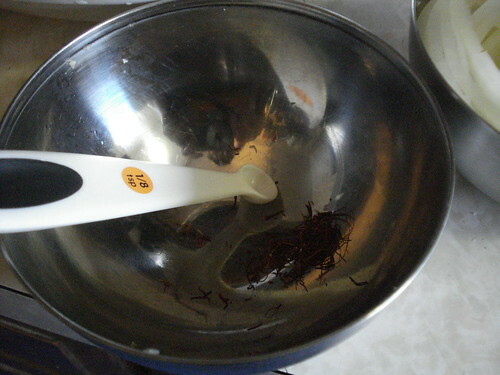 They only need to soak for 4 hours, but a longer soak does not hurt, and I knew that if I left it until morning I ran a serious risk of forgetting until it was too late. The next day I poured off the soaking water, rinsed the beans a bit with cold water to flush out the last of the discolored water, then added fresh water to the pot and brought it to a boil. I turned the heat down to the lowest setting and covered the pot, and let it simmer slowly for about an hour and 15 minutes, until the beans were tender. 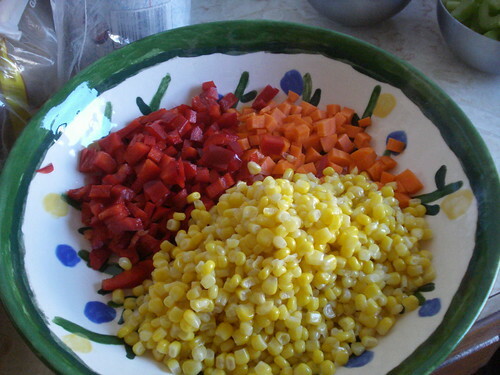 While the beans cooked I set 2 cups of corn to cook as well, then turned to my chopping. 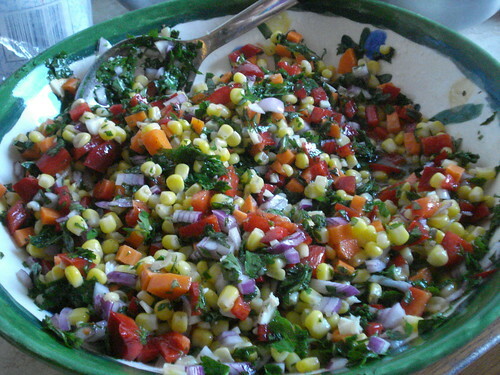 One red bell pepper, one carrot, three cloves of garlic, and a heaping half-cup of red onion, plus herbs: half a cup each of finely minced cilantro, basil and parsley. I mixed this all together. I also juiced three limes to come up with about half a cup of juice, and added that and half a cup of olive oil to the bowl, along with a bit of salt, a few grinds of black pepper, and a pinch of red pepper flakes. 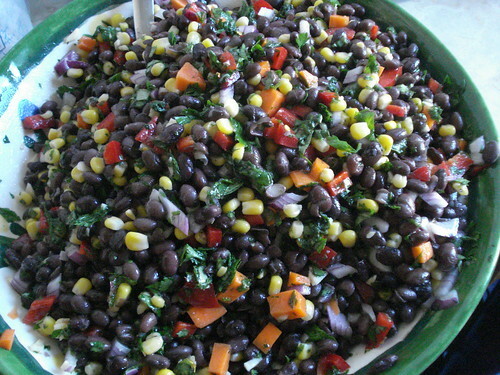 I drained the black beans, rinsed them well with cold water, drained them again, and then added them to the bowl and mixed it all up. At this point I actually brought the salad out to the dining table to get it out of my way, but remembered I had one more thing to do. (Well, two things, I thought, but there were no tortillas. 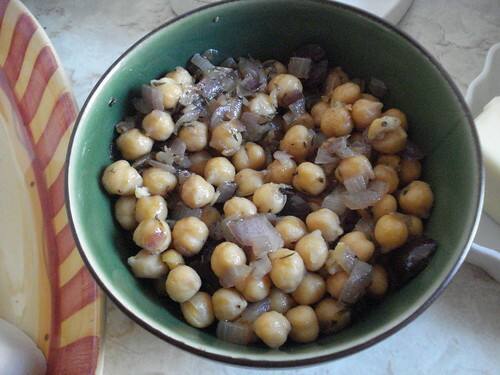 If I’d had them, I would have brushed three or four lightly with oil on both sides, sliced them into strips, and cooked them in a 350-degree oven for a few minutes until they were partly crispy and partly chewy, then scattered them on the salad. As I said, it’s optional.) I pulled out a heavy pan and heated it up, then scattered in about a tablespoon of whole cumin seeds and stirred them around for several minutes until they were toasty and fragrant. I sprinkled the toasted seeds on the salad, returned it to the dining table, and went back into the kitchen to finish my soup prep. 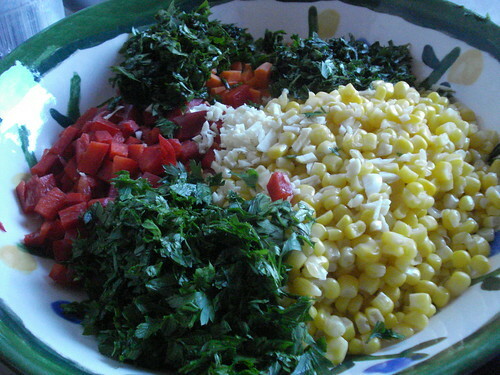 This gave the salad time to sit for a while and let the flavors blend. 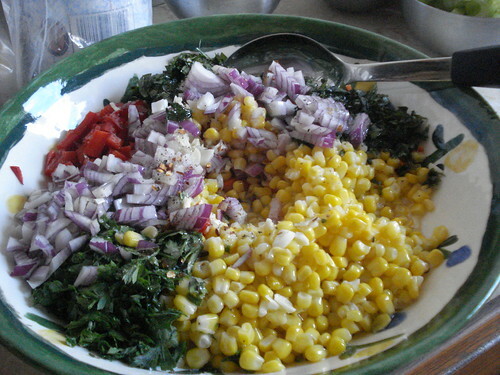 The salad was very tasty. 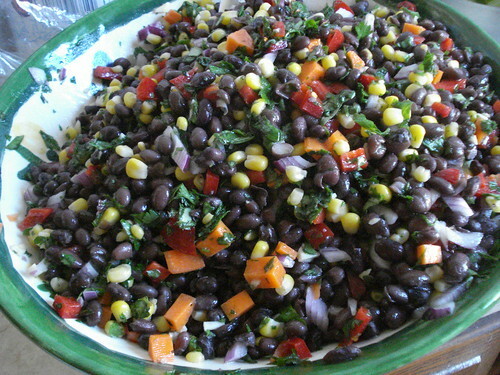 The hearty black beans provide a good base for the sweet peppers and corn, bitter and fragrant herbs, and tangy onion and lime juice. 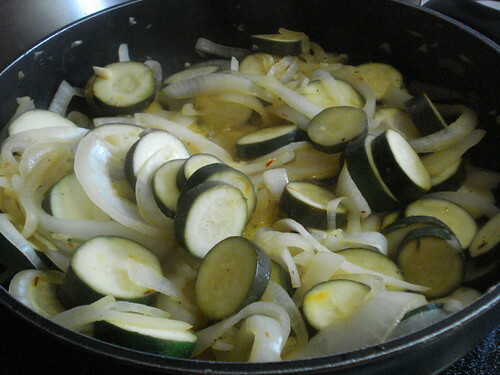 The cumin seeds added an earthy flavor. 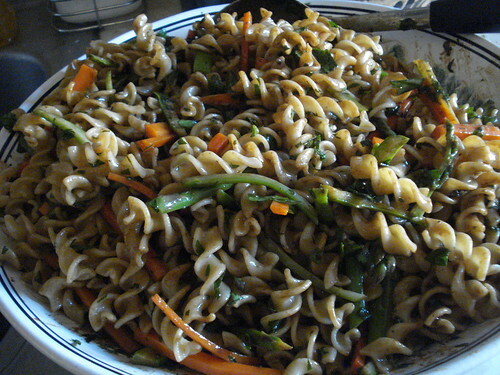 And the salad turns out to be a great brown-bag lunch for a weekday. Verdict: Success. 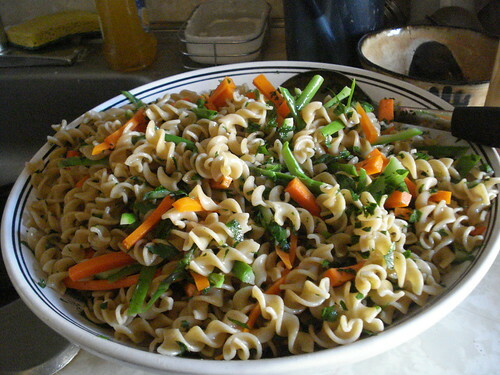 I plan to make this often during the summer. 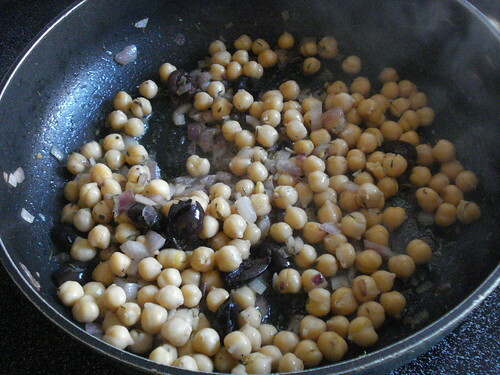 In a pinch, canned beans would do well enough, well rinsed and drained, but cooking them isn’t difficult — I think I’d only do that if I really hadn’t left time and had no other options for dinner. Last week when I was picking up some groceries, I threw a package of extra-firm tofu into the cart. When I got it home I put it in the freezer; a day or so later, I put the frozen package in the fridge to thaw out. I do this once in a while, because frozen pressed tofu has a great consistency for stir-frying. It’s a staple. Then last night, as I was getting my things ready for today, it occurred to me that I hadn’t made any plans for tonight’s dinner, that I had a thawing package of tofu in the fridge, and that I had at least two soy cookbooks still on the list for this blog. 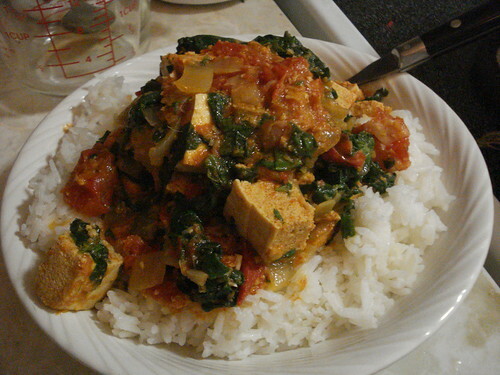 And after a few minutes of checking the indexes and skimming recipes, I had a plan: curried tofu with spinach and tomatoes, from The New Soy Cookbook. I seem to have three soy cookbooks. I don’t remember exactly when I got each, and frankly I’m kind of impressed I don’t have two copies of any of them. I also don’t remember which, if any, I have used before. There is some overlap among them, as well as with other more general vegetarian cookbooks (though as the menu of one of our favorite Japanese restaurants illustrates, just because a recipe contains soy doesn’t mean it’s vegetarian). I’ve made dishes like many of the ones in this book before, but I knew I hadn’t made this one because it calls for coconut. I grew up thinking I wasn’t a big fan of coconut. And of the kind that was most available when I was growing up in the Midwest — the chalky sweetened kind that you buy in the baking aisle and that turns over about as often as the starter on an Edsel — I am still not a fan. But fresh coconut, unsweetened coconut, has a good, honest flavor and is a great component of Asian dishes. Still, I had always been intimidated by the thought of puncturing and breaking open a fresh coconut, so I’d steered clear. But this time I thought, there’s no reason to be afraid. And besides, surely the produce stand has pre-packaged chunks of fresh, broken coconut. I was wrong. I’m sure it has in the past, but today, no. All I could find was whole fresh coconuts. So I picked one at random — it looks small, maybe it won’t be too hard to break — and headed home to try my luck. I remembered watching an episode of Good Eats in which Alton Brown easily opens a coconut, but the more I thought about it, the more convinced I was that he’d used a power drill to puncture the three little “eye” holes. That wasn’t going to be an option; we don’t have a power drill, or any kind of drill. I mentioned my misgivings to Scott. 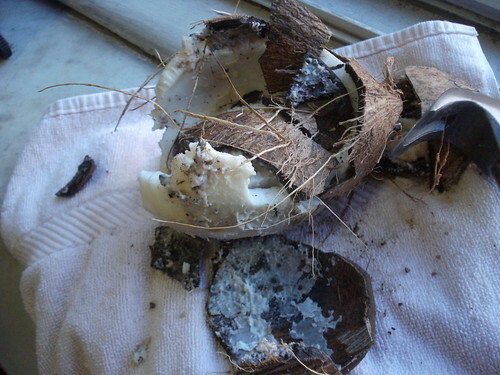 “People have been opening coconuts since long before there was electricity,” he responded. Then he used electricity in the form of power to his computer to do a quick Web search, and voila: HowToOpenACoconut.com. No power drills here! 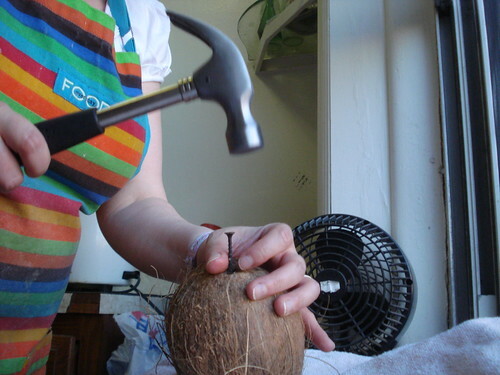 All I had to do, according to the site, was use a hammer and nail to puncture the three holes at one end so the liquid could drain out, then wrap the coconut securely in a towel and whack it with a hammer until it was as broken as I wished. What could go wrong? I thought. My brain instantly conjured up images of smashed windows, shattered crockery, crushed thumbs, cracked marble windowsills, and cats who were in the wrong place at the wrong time. It occurred to me that loud thumping would scare away the cats, so that one didn’t worry me, and I forcefully pushed aside the other images, dug out a long nail (actually a pointed screw) from the junk box, and headed into the kitchen with hammer, screw and coconut in hand, with Scott close behind with a towel and the camera. Puncturing the three spots on the end was easy, and in mere minutes I had drained away the liquid and was ready to see if I could break the coconut with my own efforts. 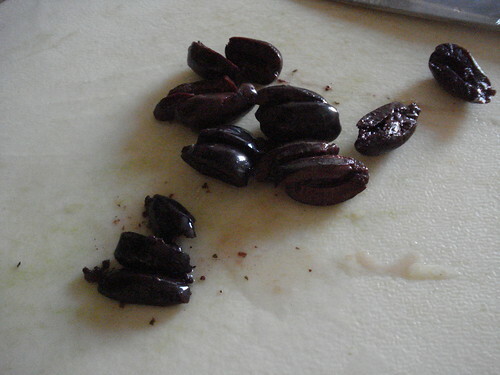 It gave pretty easily, which I quickly determined was because one end of it was actually a bit overripe. Still, the majority of the flesh was good, and it turned out to be quite simple to pare away what wasn’t quite right and still yield up a sufficient amount of hard, white coconut meat. 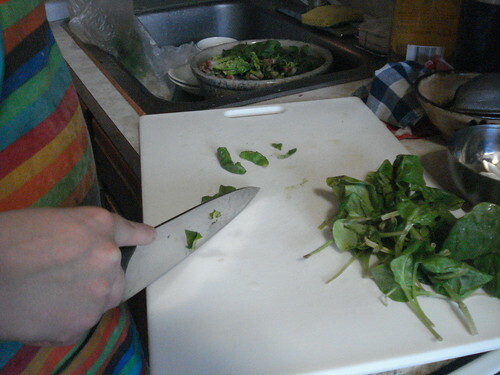 After cleaning up from that I was ready to start the regular vegetable prep: rinsing, stemming and chopping fresh spinach, seeding some plum tomatoes and cutting them into eighths, mincing some cilantro, chopping an onion. I prepped the tofu too: I squeezed the block between a cutting board and a flat dish, pressing several times until no more liquid came out; then I cut the block into cubes. 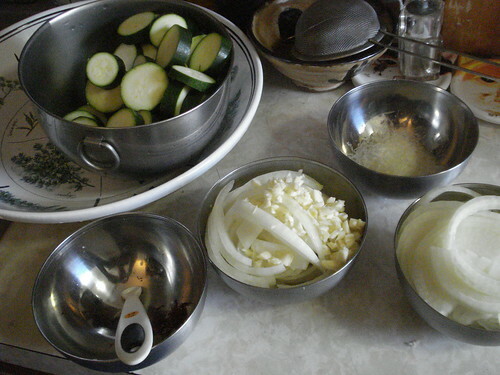 Scott got the rice cooker going and I staged my ingredients. 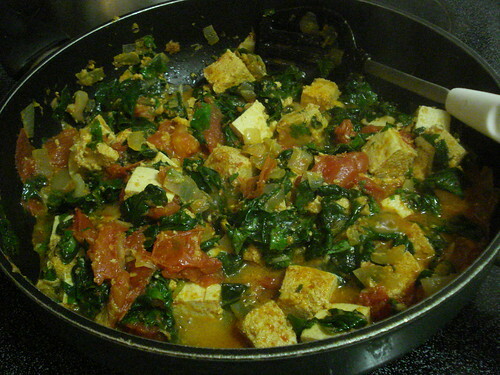 Spinach, check; cilantro, check; onion, check; tomato, check; tofu, check. I looked at the recipe again to confirm how much grated coconut I needed and saw that the list actually specified unsweetened dried coconut. Well, hell. I closed my eyes and pictured the shelves at the grocery where the nuts and dried fruit could be found. Definitely no dried coconut. 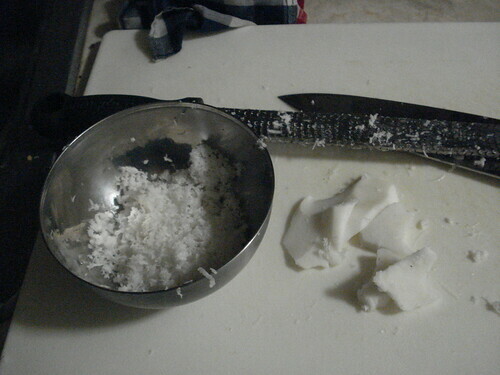 I shrugged, decided that fresh was a better substitute than chalky sweetened, and grated a little bit extra to make up for the fact that the flavor of the fresh coconut was probably less intense than dried would have been. Next to stage was “mild curry paste.” Wait, what? The recipe’s explanatory note specified a brand, but that was irrelevant, almost provocative; one thing I’ve come to learn about grocery shopping in New York was that if a recipe specifies a particular processed food, the odds are against your being able to find exactly what you’re looking for. The shelves will have “lite” but not regular, or will have the 9-ounce but not the 11-ounce bottle, or will have only competing brands. I did have curry paste on my kitchen shelves already, as it turned out, a red Thai curry paste that is not especially mild. I sighed, considered that maybe the fresh coconut would balance it in some chimerical way, considered too the fact that we like hot food, and resolved that if the final cooked dish smelled too spicy when the lid came off we’d just spoon a bit less of it over extra rice. 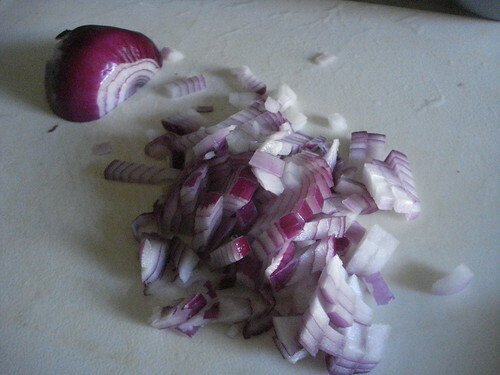 So after all this I was finally ready to cook, which turned out to be speedy and simple. 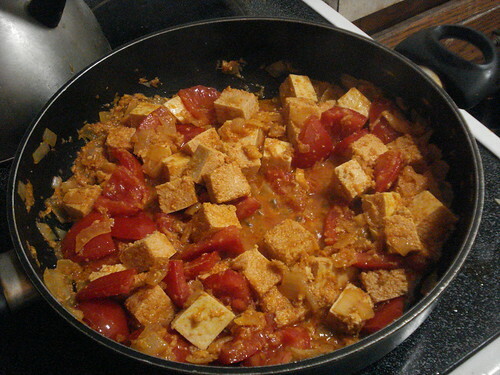 I sauteed the chopped onion in some vegetable oil for about three minutes, then added the curry paste, some water, the coconut, the tofu and the tomatoes. I covered the pan and let it cook five minutes, then added the spinach, stirring it into the sauce and watching it wilt as I mixed. I covered the pan again and let it cook three more minutes, then pulled off the lid, stirred in the cilantro, and announced that dinner was ready. And after all my missteps and misgivings, it was great. The curry paste may have been hotter than intended but it gave a good, peppy, savory flavor. The coconut gave it some depth as well. The tofu cubes had soaked up lots of curry sauce and had a dense, spongy texture. 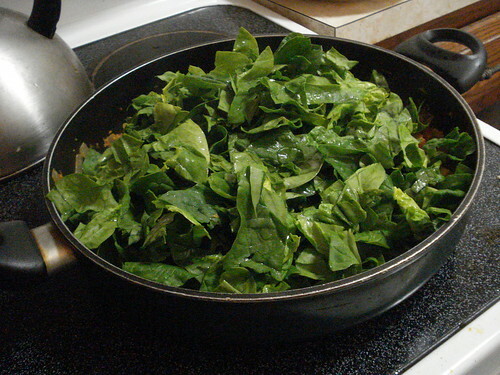 The spinach actually distributed well, not clumping up as it can sometimes do in a sauce. Verdict: Success. Now I’m kind of curious about how it would have tasted if I’d gotten it right. Yesterday afternoon I felt like baking. I’m not sure why; it was close to 80 degrees out and muggy as anything. But I wanted to make goodies to take to work, and I had some cream cheese that I’d meant to use for cupcake frosting but I didn’t get to make the cupcakes because I worked late the night I’d intended to bake. Of course I didn’t want to make cupcakes when it was 80 degrees out — or at least, I didn’t want to make frosting, only to watch it melt — but I thought, surely somewhere in the books yet to be used I can find a recipe for cream cheese brownies. You Deserve Dessert is another of those cookbooks from a cookbook club. I managed to accumulate several of these before I finally quit. They’re very pretty books, which makes them the more tempting to keep instead of mailing back. This book consists of recipes contributed by members, and as soon as I saw that I knew I was sure to find what I was looking for. 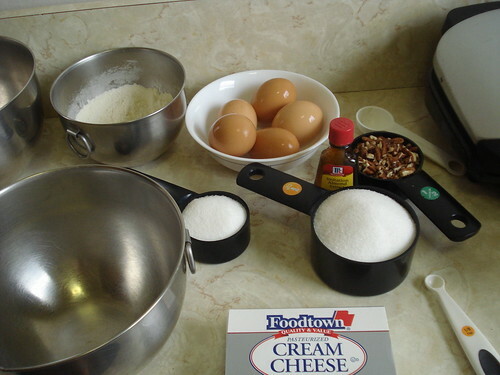 Cream cheese brownies seem like a key part of a household baker’s repertoire — though I suppose that doesn’t explain why I’d never made them for myself before. I started by buttering an 8×8-inch baking pan and then melting a stick of butter with two ounces of semisweet chocolate. I suspected this meant the brownies would be rather sweet, but I pressed on. 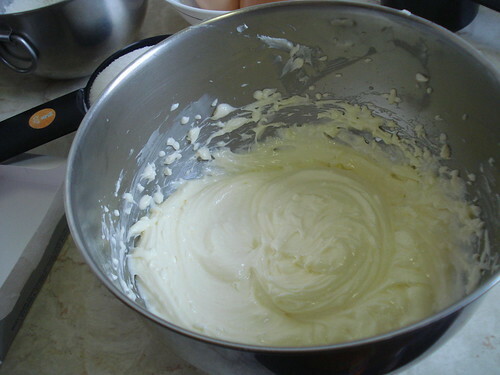 I beat 8 ounces of softened cream cheese with 1/3 cup of sugar, an egg and 1/4 teaspoon of almond extract, and set that aside. 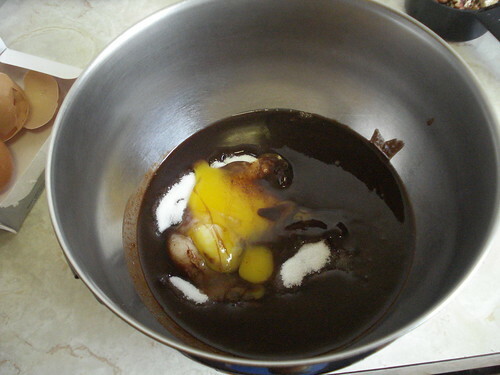 In another bowl I beat the chocolate mixture with a cup of sugar and two eggs, then added a mixture of 3/4 cup of flour, 1/2 teaspoon of baking powder and 1/2 teaspoon of salt. 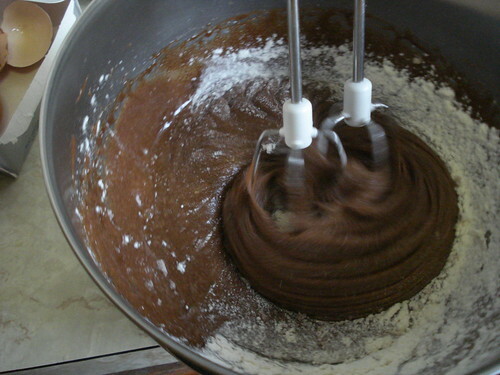 I poured about half of the chocolate batter into my pan. 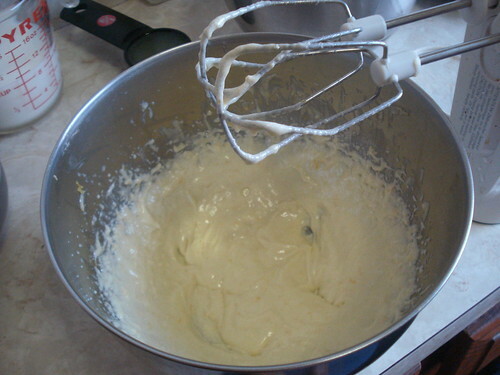 Then I added the cream cheese mixture. The recipe says to spread it on top, but of course the mixture was just thick enough that I couldn’t quite spread it evenly. 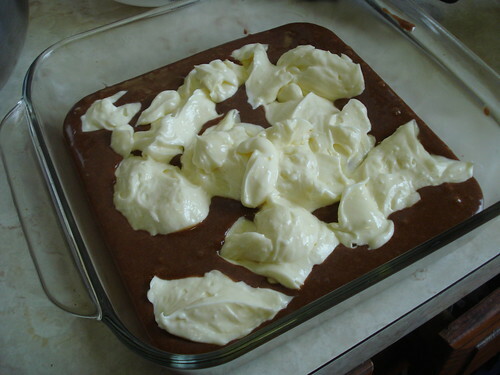 That was fine with me; one of the things I like about cream cheese brownies is the irregular marbling effect. 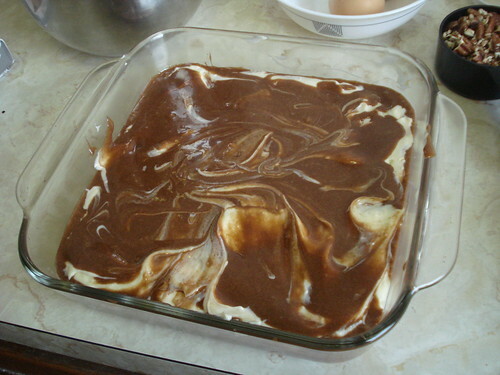 Once I’d made sure that the cream cheese mixture was equitably if not uniformly distributed across the pan, I added the rest of the chocolate batter and poked at it a bit with a spatula to ensure more marbling. Then I put the pan into a 350-degree oven, swore loudly, pulled the pan out, sprinkled on roughly half a cup of chopped pecans, and put it back into the oven. 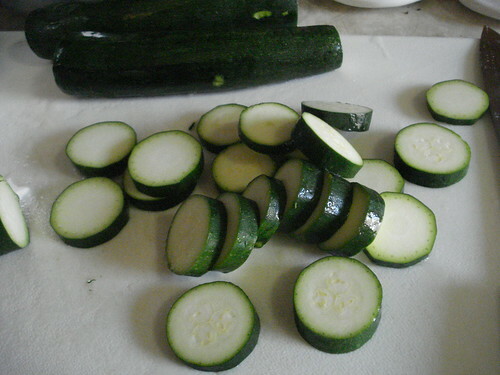 I let it bake for about 40 minutes and then let it cool for a while before cutting it into squares. The brownies were good but, as I suspected, rather sweet. I like contrast; I like a strong chocolate flavor tempered by a sweet batter, or a tart cream cheese flavor balanced against sugar. 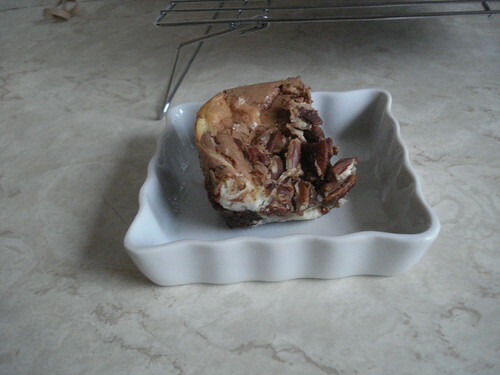 Both the chocolate part and the cream cheese part were distinctly sweet, and the pecans were unsalted, so didn’t offer much tang in contrast. Don’t get me wrong; they tasted good, and the people at work today certainly didn’t complain to me about the sweetness. But if I were to do this again I think I’d substitute one ounce of unsweetened chocolate for one of the ounces of semisweet and reduce the sugar in the cream cheese mixture a little. 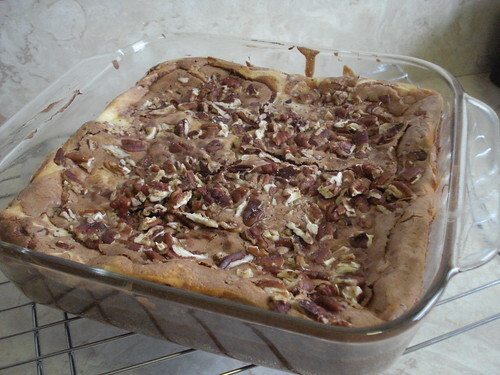 I could also use salted pecans, or perhaps I could sugar-glaze them and use half the sugar in the cream cheese part. Hmm. But I’m not making them again until it cools down here. I haven’t checked the weather forecast, so I’m not sure if that means next week or next September, but I can wait. Verdict: Success. 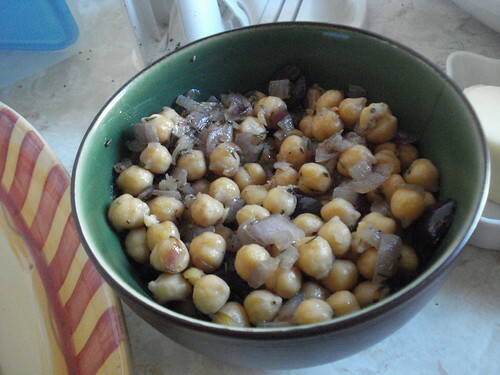 Certainly worth trying again, if only to play around with the recipe a little. I’ve had the Eating Well Dessert Cookbook for years, and I’m not sure if I’ve made anything from it. I’ve consulted it many times and have long admired its design: beautiful photos, clear and easy-to-read pages. Still, there was always an excuse. Oh, that calls for something I don’t have right now. Oh, that calls for coffee, so Scott won’t like it. Oh, that needs to chill — too late to make it now. My original plan was to take care of two recipes yesterday: to make a pasta dish from another cookbook (upcoming) for dinner and a dessert from this book. But we got a late start on the day and found ourselves out and about running errands and too hungry to wait until we got home to eat. 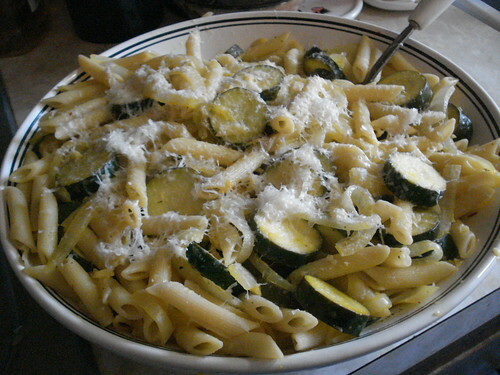 So we had a late lunch, which became an early dinner since we were never hungry enough afterward for a real meal. This happens to us sometimes on the weekends and I ought to have been prepared. Anyway, when we got home I decided that whatever the fate of the pasta dish, I would go ahead and make the lemon pudding. I chose lemon pudding for a few reasons. The chief one is that it was ridiculously warm in New York the past few days — still is as I write, in fact — and I wanted something that would be light and refreshing. 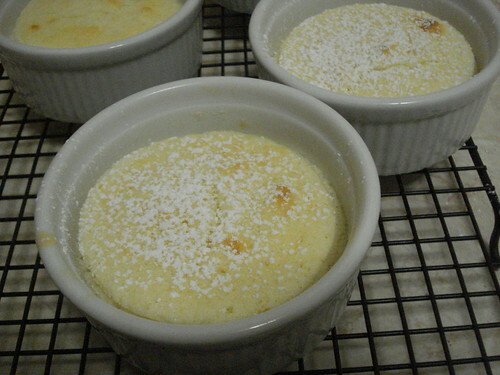 It also offered novelty: I’ve never made a lemon pudding before, and have made precious few puddings in general. And it looked simple, and didn’t add much to my shopping list. 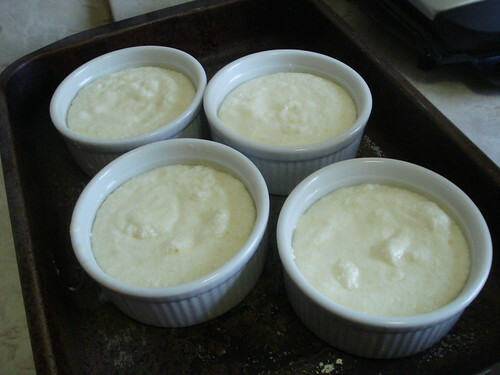 I began by lightly buttering four ramekins. 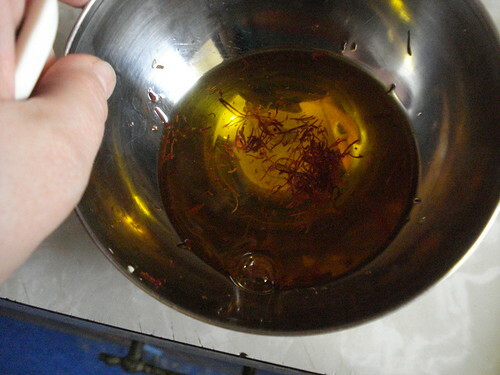 (The recipe says to oil them, but since there’s butter in the recipe I thought it wouldn’t do much harm to use it for the pans too and take a light hand. 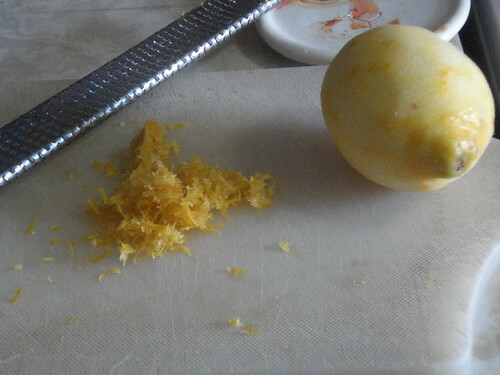 )¬† I also zested a lemon to yield two teaspoons of zest, then juiced it and one more to yield a quarter of a cup of juice. Then I separated three eggs and set aside the yolks. 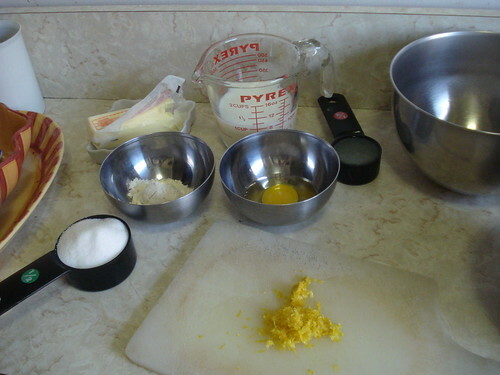 I mixed a fourth full egg with half a cup of sugar, one and a half tablespoons of softened butter, and the lemon zest, beating them together for about three minutes. 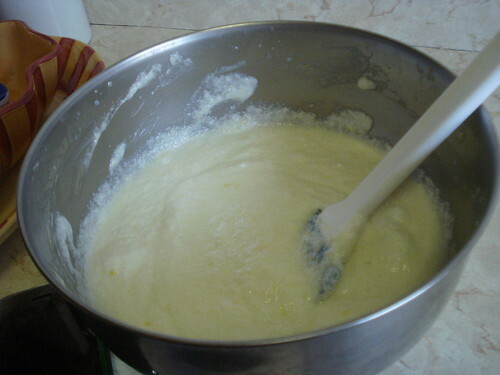 I added three tablespoons of flour and mixed that in well, then added a cup of milk and the lemon juice. 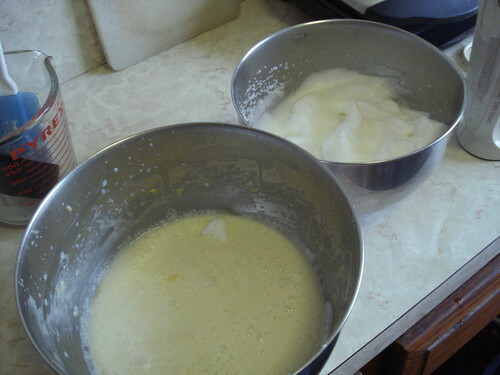 At this point I pulled out the mixer beaters and washed them, and then beat the egg whites until they were stiff but not dry. 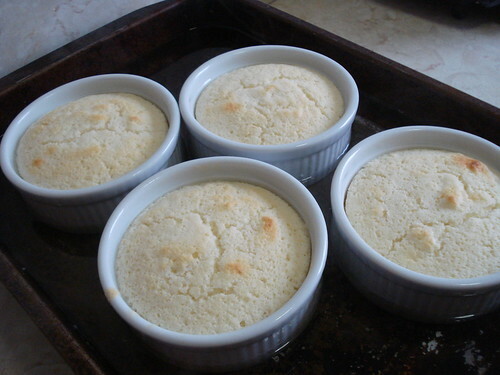 I folded them into the lemon mixture and divided the resulting thick and liquidy batter into the ramekins, which I positioned in a baking pan. 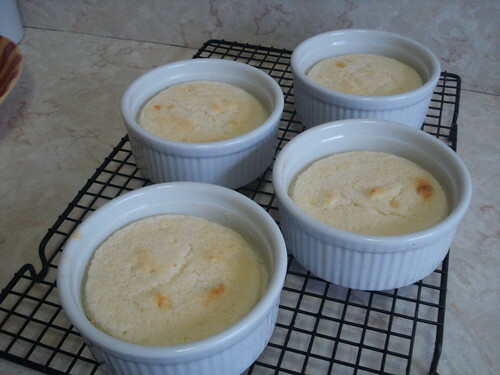 I carefully poured hot water into the baking pan so that it reached about two-thirds of the way up the ramekins. 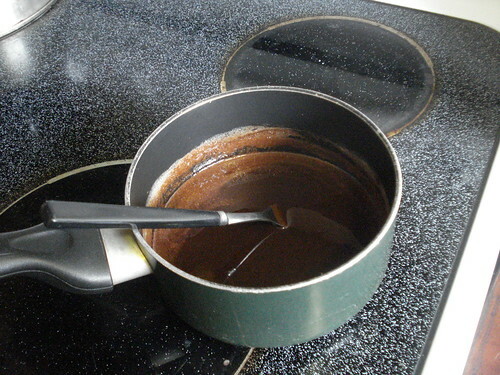 This is called a bain-marie; it serves the same purpose in the oven as using a double boiler does on the stovetop, ensuring that the food in the container is cooked gently. 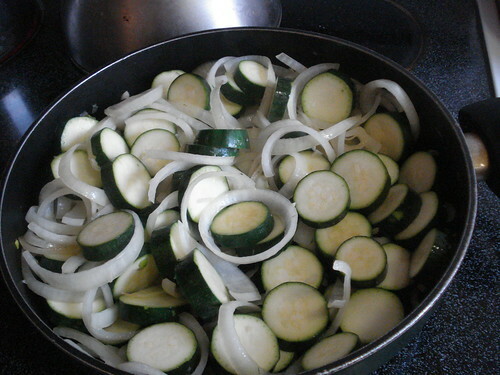 I maneuvered the pan into the oven and baked it for about half an hour. When the pudding had cooled a bit I lifted the ramekins out of the pan and let them finish cooling on a rack. When we were ready for dessert, I sifted a bit of powdered sugar on top and brought the pudding out with spoons. The pudding was delightful, with a rich lemony taste and a smooth consistency. The tartness of lemon was counterbalanced by the sweetness, particularly the powdered sugar. Verdict: Success. The only downside of this is that it requires you to heat the oven. 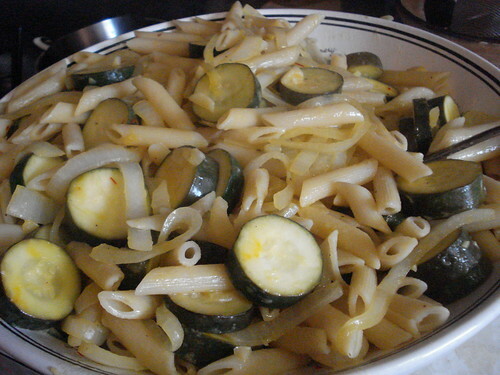 But I could always make it ahead of time and pull it from the fridge to serve on a warm summer’s night. And if the current weather is any indication, we’re going to get a lot of those this year.